I came up with this irresistible dessert when we (just happened) to have the key ingredients on hand. 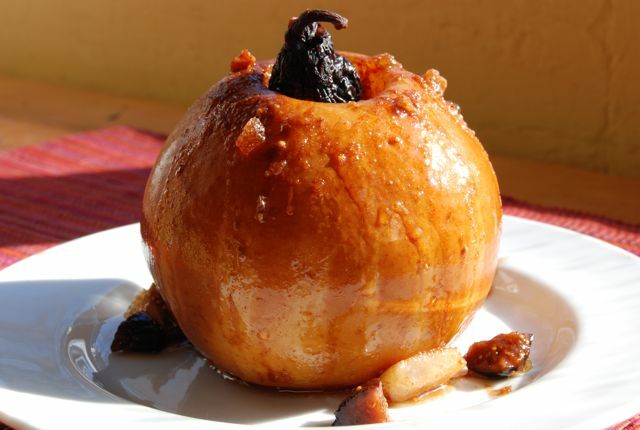 It combines two family favorites: butterscotch pears and dried figs. The pears are first cored, then stuffed to the brim with a spiced mixture of butter, brown sugar, chopped fruit and crystallized ginger. A treat as beautiful as it is delicious. Certain to get WOWS. Preheat oven to 350 degrees. Place pears in a square oven-safe baking dish and set aside. Measure remaining ingredients (EXCEPT WHOLE FIGS) into a mixing bowl. Mix well until combined. Stuff mixture into the core of the four pears, really packing it in. Place baking dish on middle rack in oven and bake 1 to 2 hours, until tender to taste. Remove from oven. Drop a whole fig into the top of each pear and serve, garnished with whipped cream or ice cream if desired.